The entire BBC website (less iPlayer) went down briefly this morning. Auntie's online offerings, ranging from free online news to telly and radio listings, recipes and educational content for kids, were all briefly offline. 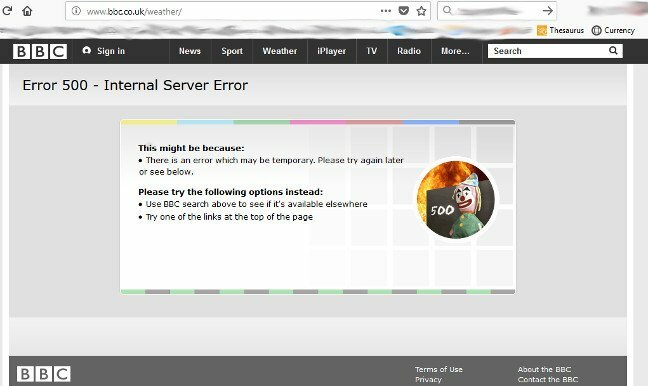 All the BBC's sub-sites were throwing up HTTP 500 errors, complete with a nice little graphic of the BBC test card doctored with a burning background. A reference to the scorchio Great British Summer, perhaps? The Beeb press office told us they were "aware of this" outage and added: "We're aware that some people are having problems accessing some parts of our website. We’re trying to fix this as soon as possible." We were told it would be back up in "15 minutes or so" around 15 minutes before publishing this, a remarkably accurate prediction. The only other Beeb-flavoured online thing accessible from Vulture Central this morning was iPlayer.